Cowslip, or marsh-marigold (Caltha palustris) is a native wetland herb. The buttercup family consists mainly of annual or perennial herbs, or, rarely, woody plants. The leaves are usually alternately arranged and palmately compound, and lack stipules. The flowers are usually bisexual, radially symmetric (actinomorphic), arranged in solitary fashion, or in racemes or cymes. 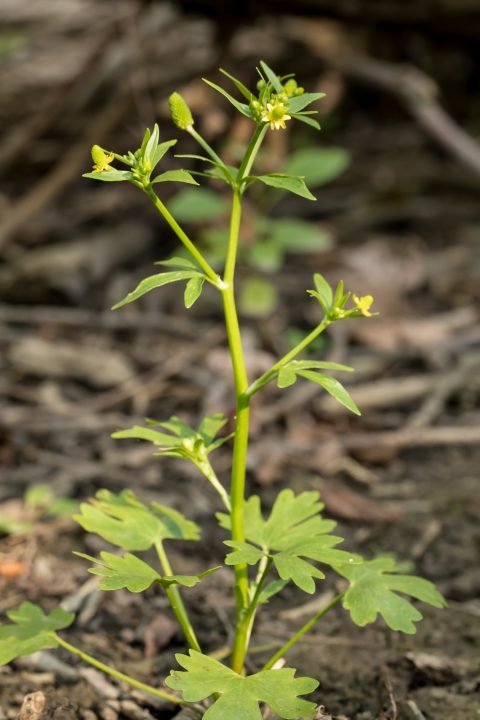 A buttercup family is typically elongate. The perianth consists of separate sepals and petals that are often not differentiated from one another, and petals are often lacking. The androecium is typically of numerous stamens, spirally inserted on the receptacle. The gynoecium is typically apocarpous, composed of many spirally inserted carpels. The fruit is a follicle, achene, berry, or a capsule (rarely). The family, while not economically important from an agricultural perspective, does contain some well-known ornamental members. These include including buttercup, columbine, larkspur, anemone, monkshood, and clemalis. The columbine, a species of which is the state flower of Colorado, receives its name from Columba, the Latin word for dove, in apparent reference to the somewhat dovelike appearance of each of its five, spurred petals (frankly, I don’t see it). Native Americans made a tea from boiled columbine roots for control of diarrhea, and members of at least two tribes believed the seeds to be an aphrodisiac. Men would pulverize the seeds, rub them in the palms of their hands and then try to shake hands with the partner of their choice. Others crushed and moistened the seeds and applied them to the scalp to repel lice. Goldenseal, a plant that was once abundant in the woods of temperate eastern North America, has become somewhat scarce because of relentless collecting by herb dealers who sell the root for various medicinal uses, especially as a remedy for inflamed throats. (Medicinal information, in all its weirdness, derived from the botany textbook Introduction to Plant Biology, 8th. edition, by Kingsley R. Stern published by McGraw-Hill in 1999). The buttercup family exemplifies primitiveness among the flowering plants, with most of its members displaying the “FENSH” flower structure. inserted spirally on an elongate receptacle. 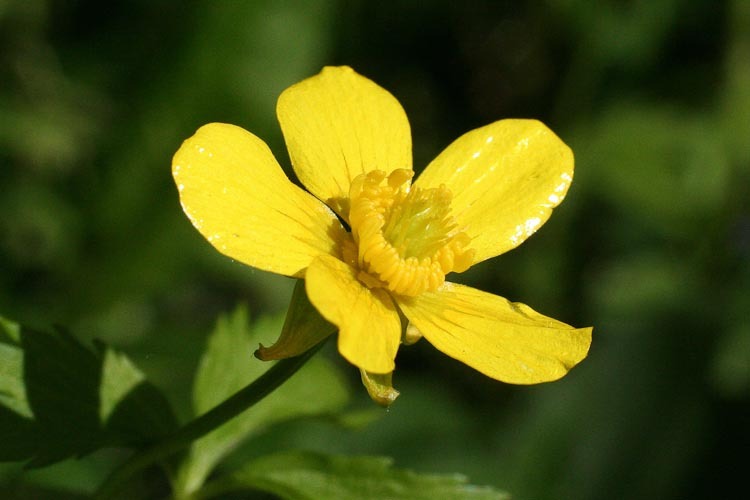 Buttercups are often called “crowfoot” because of their palmate leaves. There’s a lot of variability in the buttercup family, with many of its members displaying some, but not all, of the general family features outlines above. “Small flowered crowfoot” is also called “kidney-leaved buttercup” because its basal (lowermost) leaves are entire and kidney-shaped. Small-flowered crowfoot is a common spring wildflower. Look for the combination of small flowers and kidney-shaped lower leaves. 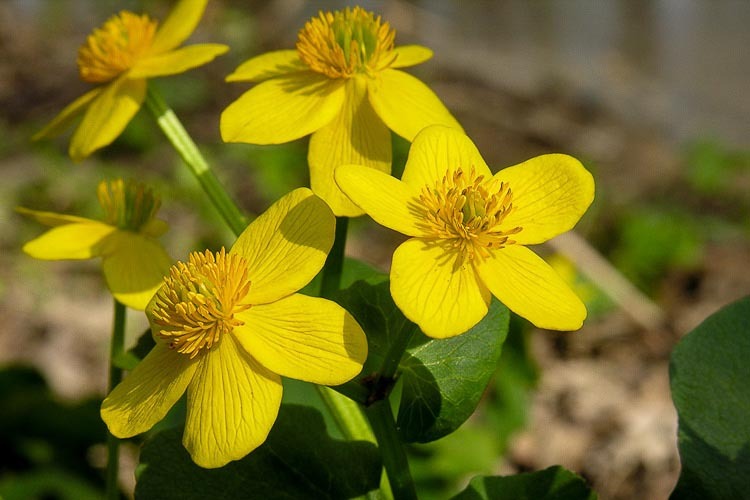 The completely very evil weed “lesser celandine” that is blanketing shaded areas along streams across central Ohio is another example of a non-crow-footed crowfoot. 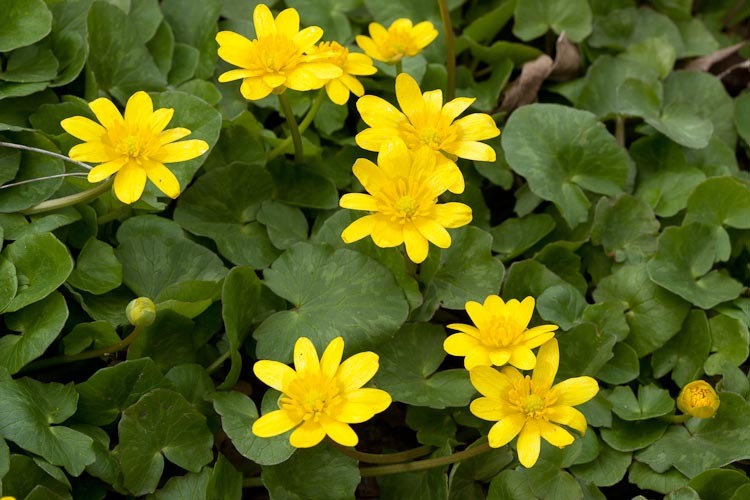 Lesser celandine is an invasive buttercup with kidney-shaped leaves. 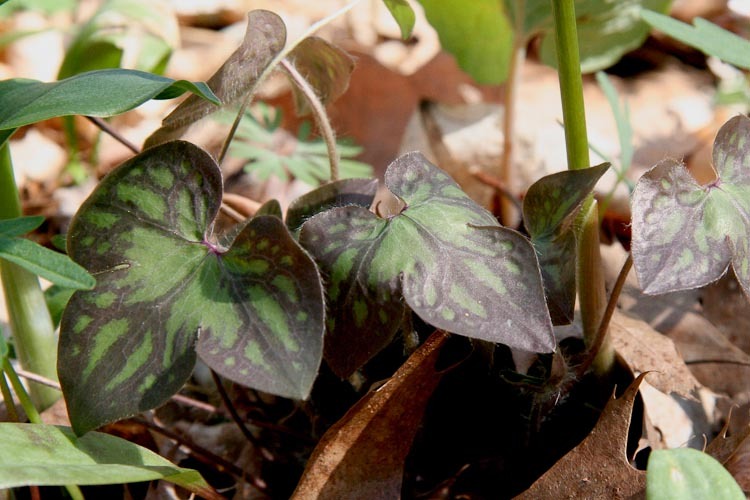 Another member of the Ranunculaceae that has non-crow’s-foot shaped leaves that is named after a body part is “hepatica” (Hepatica species in older book; Anemone nobilis in newer ones) also called “liver-leaf” because its leaves resemble a human liver (creepy, eh?). 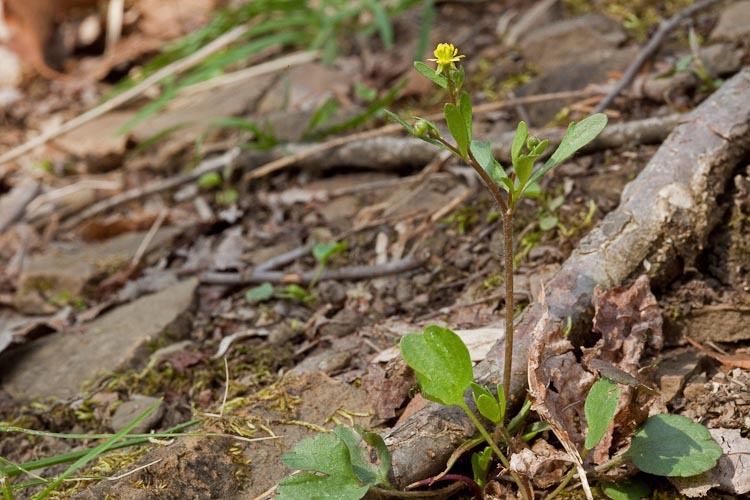 This forest wildflower is easily recognized by its leaves alone, which are present even during winter. “Doctrine of Signatures,” could cure liver ailments! 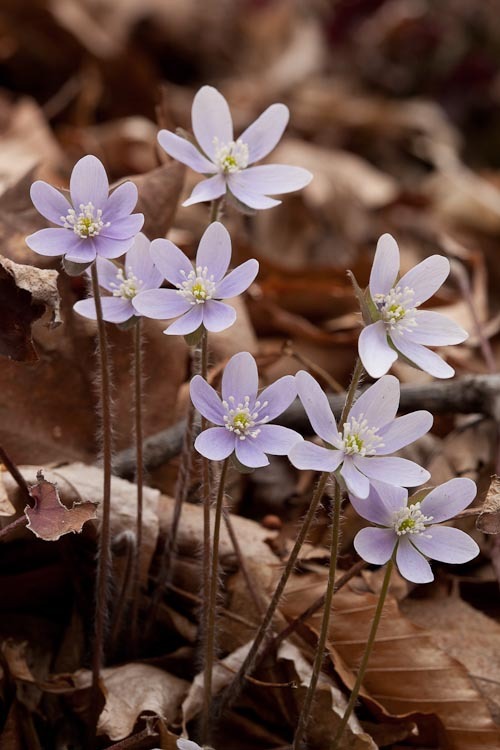 Hepatica is one of our earliest-blooming wildflowers. The blossoms rise above the leafy forest floor at a time when the plant’s leaves are inconspicuous. Hepatica flowers appear in very early spring. 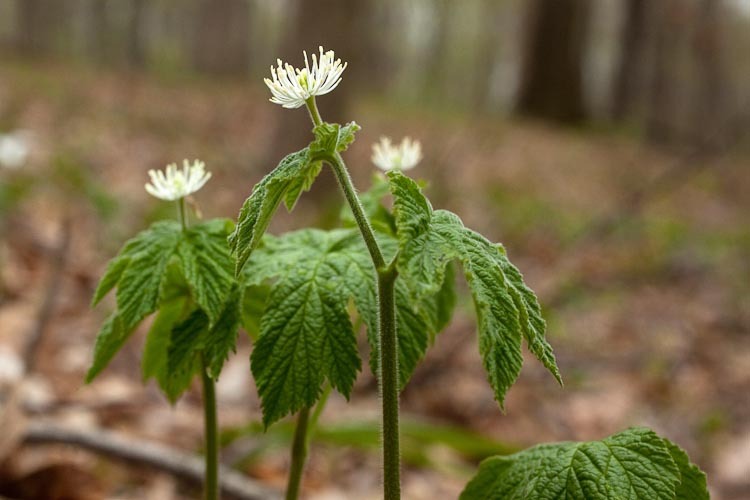 Speaking of medicinal members of the buttercup family, goldenseal is one that, while not connected with the doctrine of signatures, has had a long history of medical use. Purported to be a remedy for various throat and skin conditions, goldenseal’s root has been relentlessly over-collected by herb dealers and so is scarce across much of its range. Goldenseal is an intriguing species. It is a clonal forest understory herb with large palmately lobed leaves and flowers that are conspicuous despite the fact they have no petals or sepals! The showy pollinator-attracting part of the flower is the numerous stamens with bright white somewhat expanded filaments. Goldenseal is a forest wildflower that is threatened by over-collection by herb dealers. Goldenseal fruits are an aggregate of bright red berries. Here’s an action-packed video of a harvestman (“daddy long-legs”) standing on a fruiting goldenseal plant. Harvestman stands on goldendseal leaf. 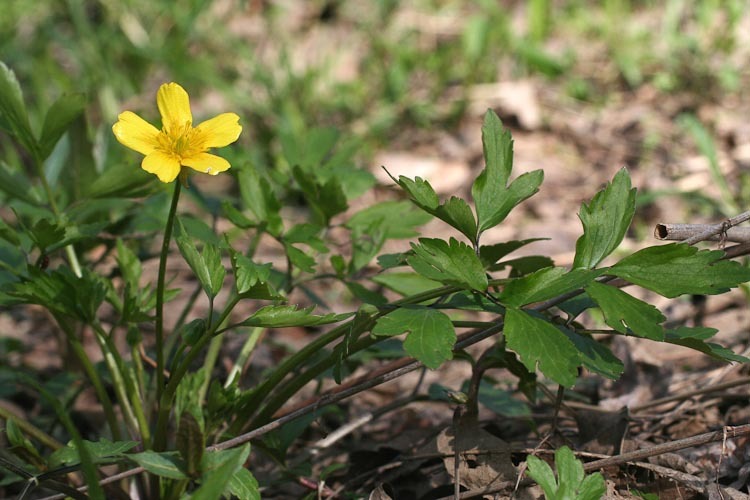 “Isopyrum” (Isopyrum biternatum) is a forest wildflower that exemplifies that buttercup family, albeit in a somewhat confusing manner. Sometimes called “false rue-anemone” because of its striking resemblance to a plant called “rue-anemone,” isopyrum has leaves that technically are alternately arranged, but inasmuch as they are palmately compound but their leaves lack a leafstalk, they appear to be whorled (like the leaves of rue-anemone). Isopyrum is a forest wildflower with alternate palmately compound leaves. 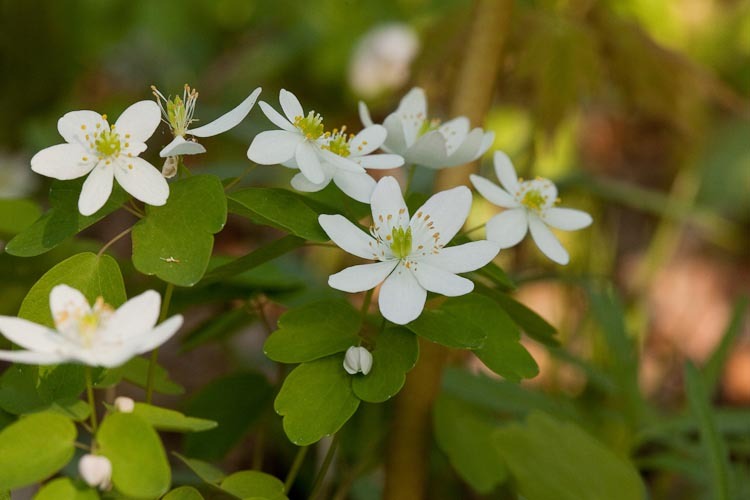 Are you curious about “rue-anemone,” the plant that isoppryum so resembles taht it is called “false rue0anamone”? 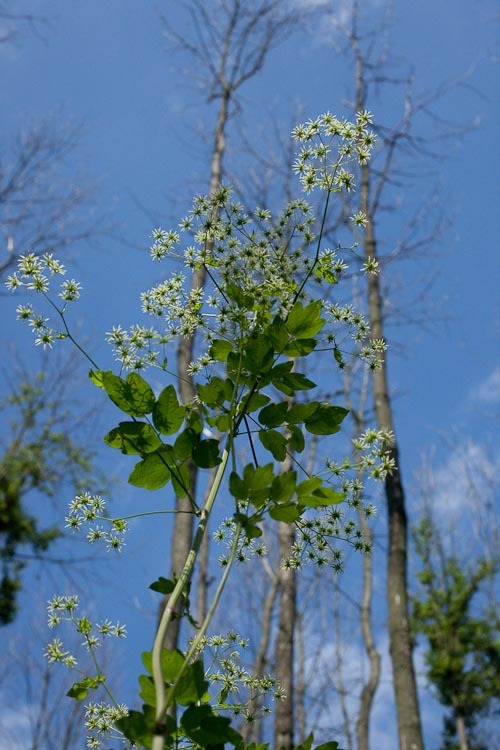 That plant, also common in in the midwest, was formerly called Anemone thalictroides, (meaning literally “Anemone that looks like Thalictrum“) but recently has been recognized as being a genuine Thalictrum with the awkward name Thalictrum thalictroides (meaning a Thalictrum that looks like a Thalicrum!). Rue-anenome leaves are genuinely whorled instead of being alternate like those of isopyrum but, as mentioned above, the difference is difficult to discern. A better way to differentiate the two lookalikes is in their flowers, close up. See how different the developing fruits are. Those of isopyrum are smooth and swollen at their base (and they are follicles, each containing several seeds), while those of rue-anemone are longitudinally ridged and spindle-shaped (and they are achenes, each containing a single seed). Rue-anomone is a forest wildflower with whorled palmately compound leaves. Anemones (genus Anemone) and meadow-rues (Thalictrum) are among our most conspicuous buttercups. Many of the them are found in more open areas than the other buttercups and can be considered prairie wildflowers. Thimble-weed (Anemone virginiana) is named for its especially elongate receptacle that, in fruit, is covered with a multitude of tightly packed achenes, giving it a thimble-like aspect. 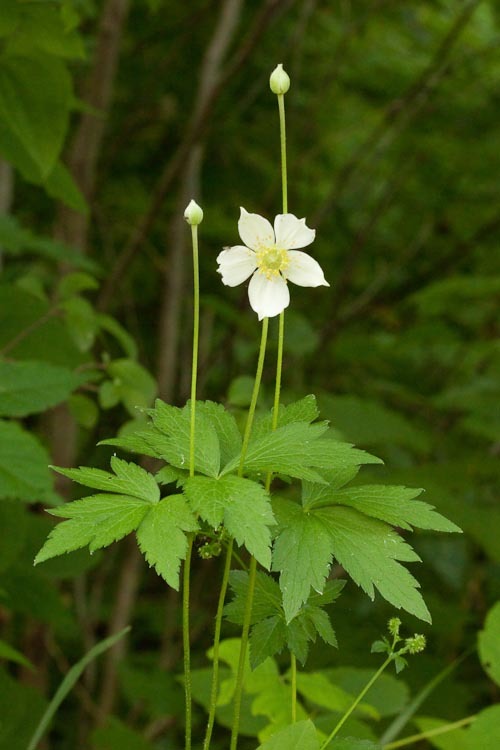 Thimbleweed is a tall wildflower with whorled leaves. 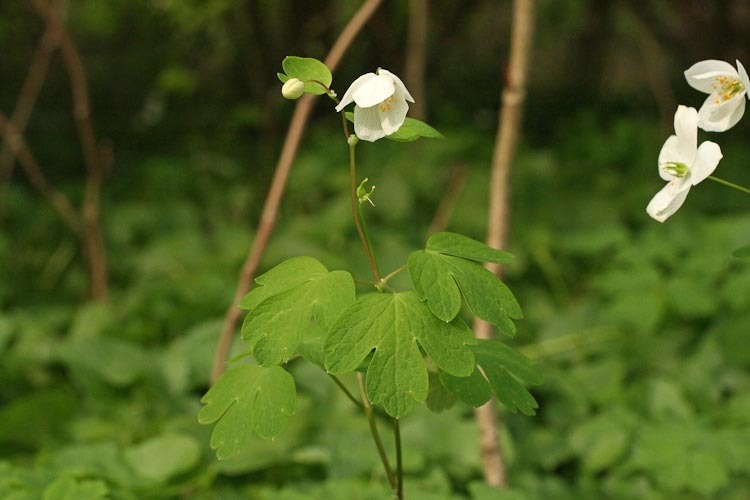 Meadow-rue (genus Thalictrum) is a genus that includes some especially tall wildflowers. This one, tall meadow-rue, is common in prairies and woodland borders. Tall meadow-rue is an herbaceous perennial of open areas. 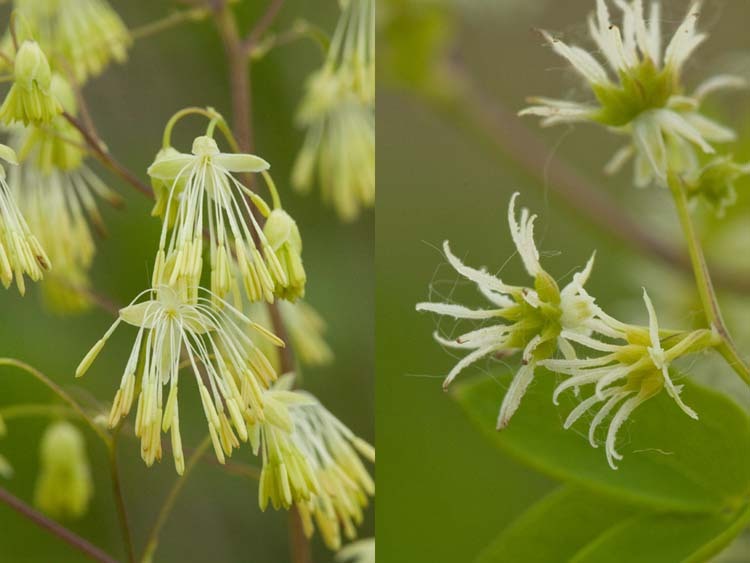 Tall meadow-rue is predominantly dioecious, i.e., having separate male (staminate) and female (pistillate) individuals.Below, see closeups of the two types of flowers. Note also that they are apetalous, in association with the fact they’re wind-pollinated. Tall meadow-rue is dioecious and wind-pollinated. Left: male (staminate) flowers. Right: female (pistillate) ones. Perhaps not surprisingly, the buttercup family includes some showy pants that have been taken into cultivation as garden flowers. 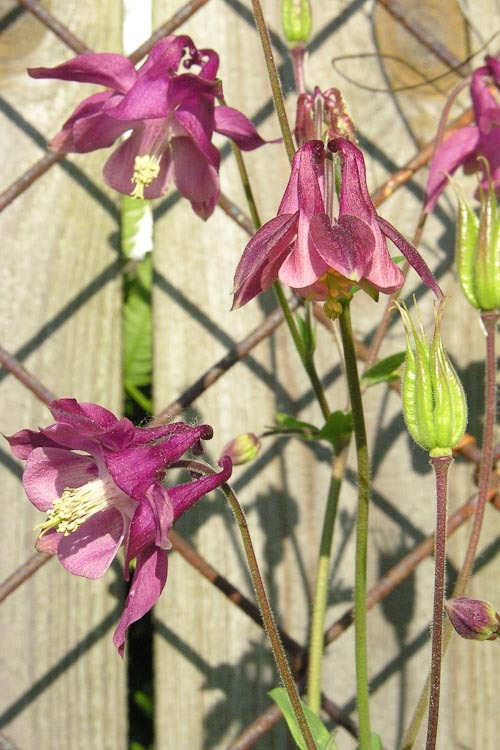 One of them is garden columbine, Aquilegia vulgaris. Columbine is a popular garden flower. Note the spurred petals, and follicle fruit type. Cursed crowfoot, Ranunculus sceleratus, is a wetland wildflower. Thimbleweed, Anemone virginiana, is a prairie wildflower. 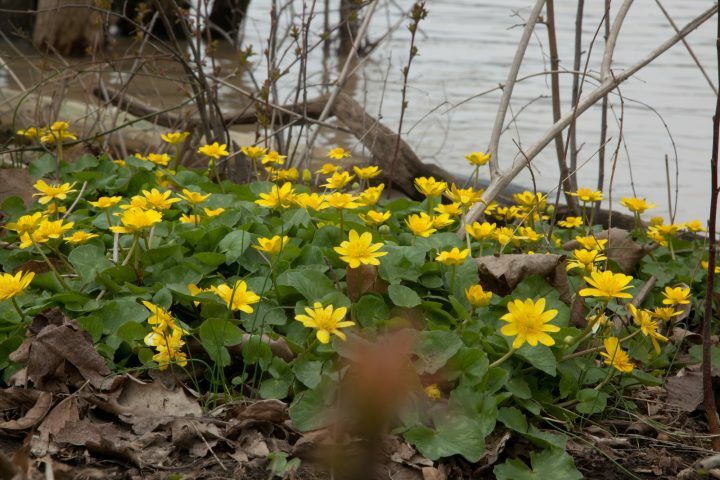 Lesser celandine, Ficaria verna, is a pernicious weed in low woods, especially along river systems in central Ohio.